I used to hate meatloaf as a kid. It was all dry and tasteless, and frankly I couldn’t handle that much meat at one time. When we first moved to St. John’s, I decided to try to make my own, slightly tastier version, as meatloaf is a Pie favourite. 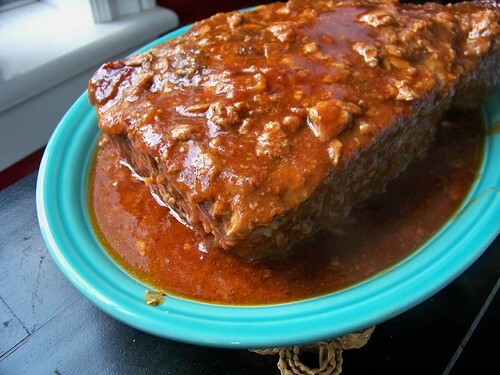 The result was incredibly popular and completely changed my opinion about ground beef in loaf form. 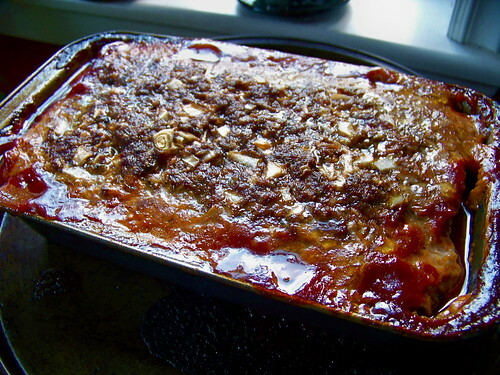 The only things that are really clear in my memory are that I ignored all the recipes I found completely, and that the crucial part of the recipe was to put the meat loaf into a bath of ketchup. Weird. Yes. Good. Oh YES. In a bowl, you put yer meat. I think I used about 600-700 grams of medium ground beef, but enough to fill out a standard loaf pan. 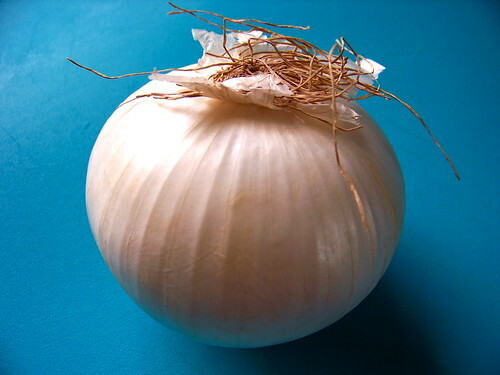 Mince up an onion and chuck it in there, along with some garlic in a jar to suit your preference. Add some herbs. Don’t be shy. 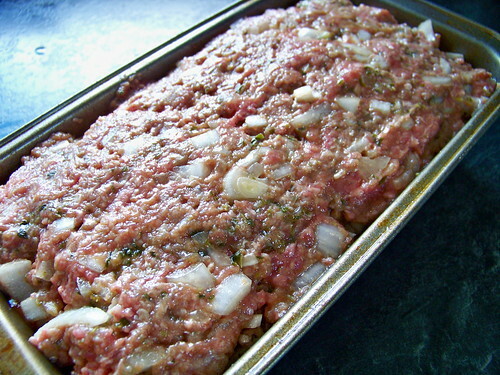 The secret to good meatloaf is to be generous with your spices. 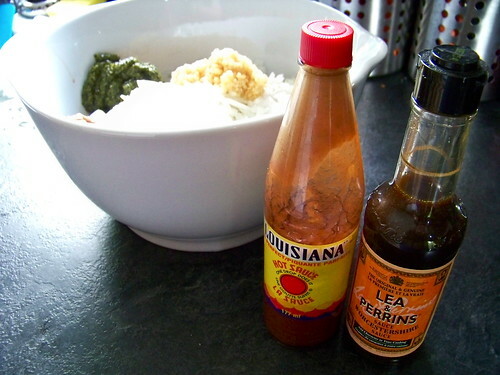 Here I used a minced combination of Italian herbs, and several healthy dashes of Louisiana hot and Worcestershire sauce. 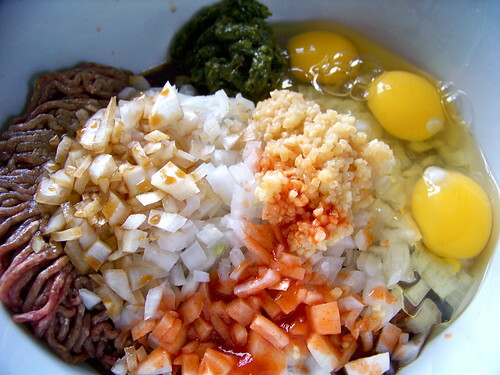 Then add three eggs for cohesion. Mix it up with your hands. This isn’t like burgers where you have to worry about not touching them too much – you can get right in there and mush it all up really well. Now comes the crucial stage. 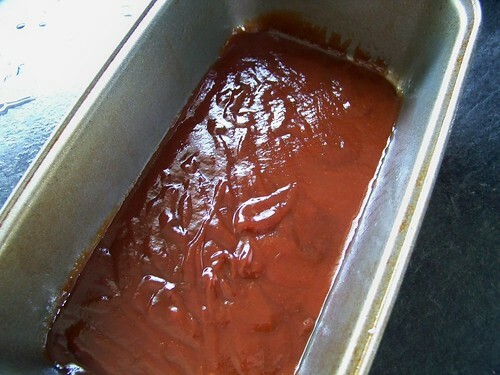 Pour enough ketchup or barbecue sauce into your loaf pan to cover the bottom. 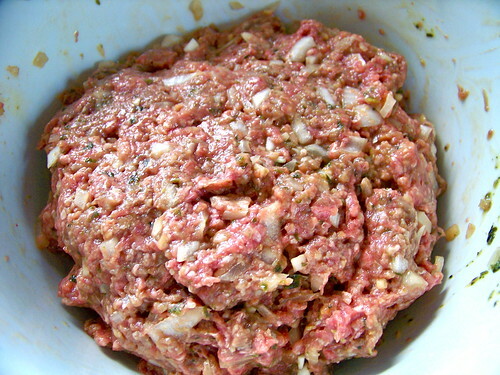 Then scoop in your meatloaf mixture and shape it to fill the pan. Put your loaf pan on another baking sheet (because this will bubble all over the place) and bake it for an hour or so, until the internal temperature reaches 160°F. Pull it out and let it rest for ten minutes or so. 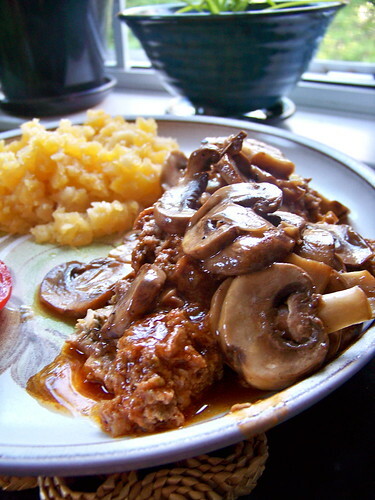 Very carefully (because this version of meatloaf isn’t the most stable of beasts) transfer the meatloaf to a plate and pour all the juicy sauce over your loaf. It makes for great leftovers, and is fantastic in sandwiches. Just make sure to cover it up so it doesn’t dry out in your refrigerator. This looks like a good recipe. I wonder if you put your ketchup on the top that wouldn’t preserve some of the juiciness of the meat. 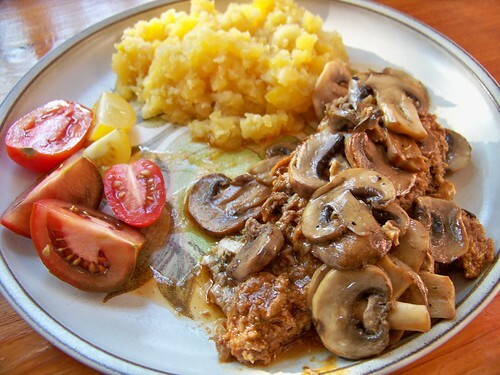 If it is too meaty for you try ground chicken which is quite delicious. It’s true, it probably would. With the sauce on the bottom, though, I find it comes up the sides and also bubbles over the top so not only is the top still juicy but there are no hard crusty bits in the bottom of the pan that are difficult to remove. That’s a great idea to try the chicken. I will definitely look into that, thanks! 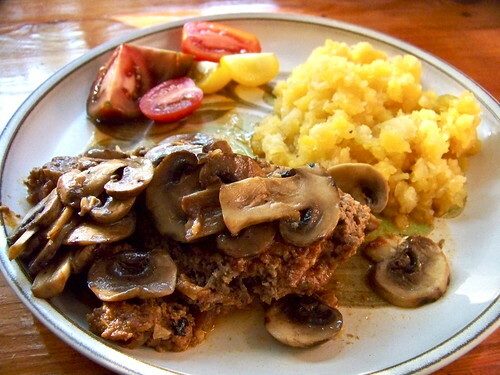 This sounds amazing, and I have been looking for a good meatloaf recipe!